'Tis the time of the season: everywhere farmers' markets are showing off their squash, eggplant, peppers and tomatoes. So what does that mean? Why ratatouille, of course. Ironic because it's a peasant dish, stick-to-the ribs food, and evokes cold winter nights. But screw it: the time is now, the produce is at its peak, you can serve it cold, and DAMMIT THIS RECIPE IS INSANE!!!!!!!!!!!! My friend Bridget found it on Epicurious and sent it to me. 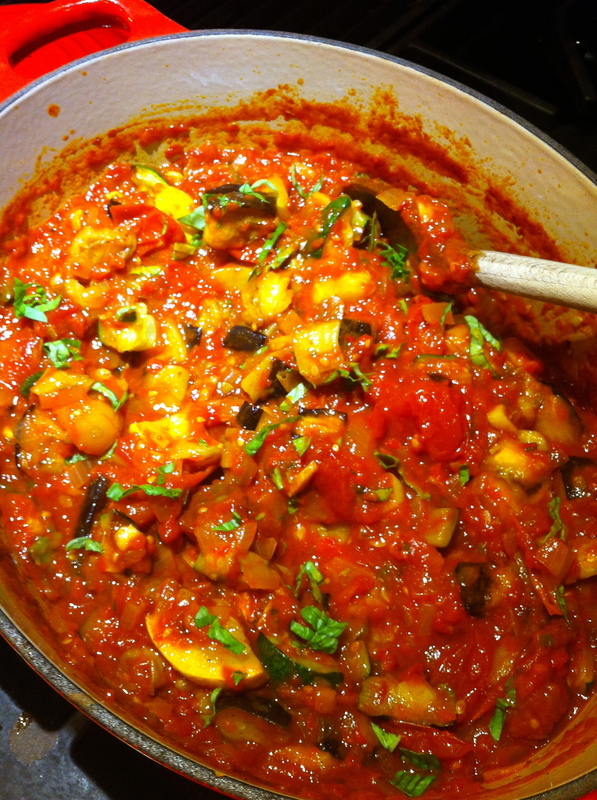 The author, Francis Lam, coined it "Weapons-Grade Ratatouille" and rightly so. You can win a war with this dish. My friend Becky challenged me to make it the way Remy does in Disney's Ratatouille. If only I had that kind of patience, not to mention a mandoline. So this is going to be vegetable mess style. And I've decided that the next party I throw is going to be one giant pot of this ratatouille, a couple giant rosemary focaccias, and big bottles of wine. To be consumed while standing around in the kitchen. I cannot wait. The point of this recipe isn't to follow it slavishly. If you want more of this, got less of that, go for it. The only thing I insist you do is block off some time on your calendar and hang out with your vegetables for an afternoon—the low, slow cooking is what makes it knock your momma's bonnet off. ½ cup of extra-virgin olive oil. Yes, that much. Summertime is living it up time. 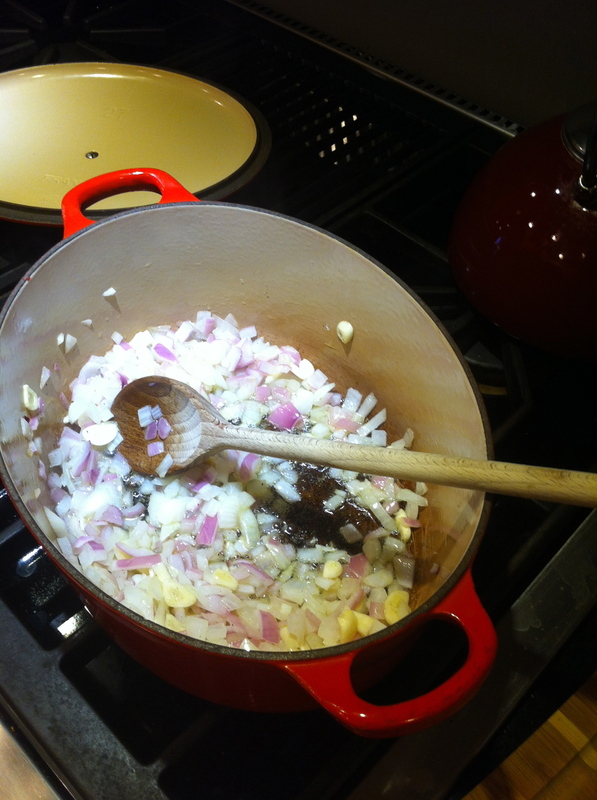 Cook shallot and onion (or garlic) in the ½ cup of olive oil over low heat in heavy pot so that they soften and give up their liquid. Stir; don't let them brown, and season lightly with salt and pepper. Cut up your other vegetables while you're doing this. Once the onion mixture is pale gold and sticky, add the puréed red pepper. Red peppers have a ton of water, let it cook down, stirring to make sure nothing gets too caramelized and burned. Then you'll have a rich, rusty jam. To said jam add your puréed tomatoes. Bring it to a boil, and turn the heat way down to let that baby snooze off all its liquid. Season lightly with salt and pepper. You're concentrating sugar and tartness, to be umami-oooo-Mommy. Around this time, heat oven to 450. Toss the zucchini with salt, pepper and olive oil. Roast hard in one layer on a baking tray. Check after 15 minutes: when you get nice browning underneath, take the tray out. Cool a bit before putting roasted squash in a big bowl. Repeat with the eggplant. Keep cooking down your onion-pepper-tomato jam. You'll know it's ready when it gives oil back up. Chop up some thyme and basil and stir it in. Carefully combine the tomato base with the roasted vegetables. Stick a spoon into it and feed it to people you love. Then wrap it up tightly and let it sit in the fridge for a day; it'll be even better tomorrow—the flavors meld, the herbs work their way through the whole thing. Just let it come back to room temperature when you serve it to your favorite people, maybe with some cheese and bread, and try not to break too much furniture. Keeps in fridge 3-4 days and freezes well.